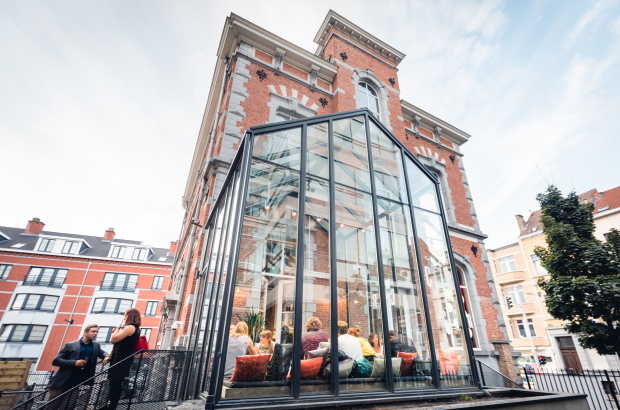 Housed in an imposing Flemish Neo-Renaissance redbrick building on a corner with Avenue de La Couronne, Comptoir Rodin is a rather special daytime find in Ixelles. Walk up the small flight of stairs to discover a stylish eatery with a relaxed New York vintage vibe, alfresco garden seating and lovingly crafted food. Apart from the freshly pressed juices, gourmet coffee and all-day counter selection of bakes, a daily lunch menu is chalked up on a blackboard. It has six dishes, and changes every two days. It caters for everyone, offering meat, fish, chicken, vegetarian and vegan dishes influenced by Middle East and Mediterranean flavours, and seasoned with herbs such as parsley, coriander and lemon verbena, from the kitchen’s herb garden. What the blackboard doesn’t tell you is that when it arrives, each dish is a blaze of colour, whether it’s a sesame glaze, an accompanying sauté of vegetables, a salsa of four different colours of cherry tomato, or the purples and oranges of red cabbage, carrots and toasted almonds in a salad. Born in Morocco, raised on a Kibbutz in Israel and cooking in Belgium for the past 35 years, Malka has modernised the recipes of his youth. You might find Israeli street food like roasted cauliflower on the menu served with a sesame sauce, or a fruity version of tabbouleh accompanied with watermelon and feta cheese. Most Fridays, Malka makes braided Halla loaves to serve with lunch, but often coats them with wasabi and sesame seeds and binds the dough with his secret ingredient, apple juice. The result is soft and springy, with the tang of the seeds and a very subtle sweetness from the apple. It’s substantial enough to dip or to mop up a sauce. At weekends Comptoir Rodin offers a set price brunch that’s popular with cosmopolitan Ixelles. Here you’ll find Shakshouka, a brunch dish made with a base of tomatoes, sautéed with garlic, green chilli and cumin on top of which Malka cracks eggs, sprinkles fresh coriander and his confidential hot spice mix that gives it an added kick. “But we also adapt it for anyone who can’t manage spice or tomatoes” says general manager Jérôme Marit, whose personal favourites are the spiced lamb kefte kebabs with a yoghurt and pepper sauce. Comptoir Rodin opened in September 2017, after the building was bought and redesigned by Guillaume de Posch, former co-CEO of the RTL Group. It was built as a pavilion to Ixelles military hospital at the site in 1888, where de Posch’s grandfather recuperated, having been wounded during the first world war. De Posch says he “fell in love” with the building at first sight. The eatery was conceived to open part of the building to the public, and architectural plans of the hospital are on display.